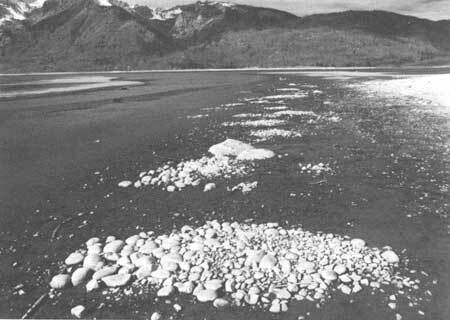 Around 8,000 years ago, the warming climate of Jackson Hole reduced the glaciers to mere remnants high in the mountains. Also during this period, lodgepole pine became the dominant conifer in the area, growing in stands with aspen and Douglas fir. During this time, prehistoric populations in the mountains of northwest Wyoming began to eat more small animals and wild plant foods. Changes in spear point styles and food-processing activities signal the beginning of a long period that archeologists refer to as the Archaic. The Archaic period lasted approximately 6,500 years in this region, and has been divided into three separate periods simply referred to as Early, Middle, and Late Archaic. These divisions are based primarily on changes in spear point styles. The records of D. B. Shimkin, the anthropologist who documented much of the Wind River-Shoshone culture during the late 1930s, reveal that these most recent American Indian inhabitants of Jackson Hole traditionally gathered plants for medicine, food, and manufacturing materials. According to Shimkin, individual women or small parties gathered the roots, berries, seeds, pistil, and leaves of a variety of plants. Wild roots, including camas and wild onion, were dug with wooden digging sticks, while currants, rose hips, hawthornes, and gooseberries were picked and then ground with a stone grinding implement. This tool, known as a mano, was usually made of sandstone and used in a back-and-forth rocking motion across another larger flat rock known as a metate [Figure 7]. Berries were also dried and boiled in soup, or mixed with grease and dried meat to form an easily transportable food called pemmican. These food-processing traditions remained unchanged from the Early Archaic period. 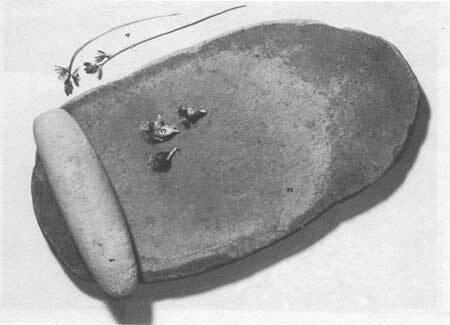 In addition to the introduction of plant roasting pits, the stone tools found at Jackson Lake also show a cultural change during the Early Archaic period. Spear points from this time period are large with notches on either side of the base, which were used as a way to haft the point to the spear [Figure 8]. Although the use of chert, a stone material, for spear points increased during the Early Archaic period, obsidian continued to be an important raw material. Obsidian spear points from Jackson Lake show a continued reliance on the Teton Pass sources. This demonstrates a strong familiarity with, and possible travel route through, the southern end of the valley. 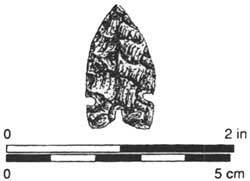 The number of spear points that date to this time period is low when compared to subsequent time periods. To date, the above-mentioned roasting pit is the only feature from the park that is radiocarbon-dated to the Early Archaic. In addition, archeologists have found no Early Archaic residential structures in Jackson Hole. However, in the nearby basins of Wyoming, Early Archaic people resided in semi-subterranean pithouses. These houses were broad pits dug into the ground and covered with a structure of wood, brush, and hides. An overall paucity of data concerning this time period remains as a gap in the overall understanding of prehistoric life in Jackson Hole. Around 5,000 years ago, prehistoric spear points underwent a notable change. In addition, an increased number of roasting pits date to this era. These changes mark the beginning of the Middle Archaic time period, which extends from 5,000 to 3,000 years ago. The increased density of roasting pits and stone-grinding implements found at Jackson Lake suggests that Middle Archaic people invested more time and energy in processing certain plant foods. The overall increased number of archeological sites across the region also suggests a general population increase, or more frequent travel by these people. Tipi rings also begin to appear in the archeological record during this time. A tipi ring is a large circle of moderate-sized stones used to anchor a tipi. When the tipi is moved, the stones remain in a circular pattern on the ground. The tipi was made with long poles and covered with animal hides. When the group needed to move, the tipi could be easily dismantled and carried, unlike the more permanent pithouse used in earlier times. 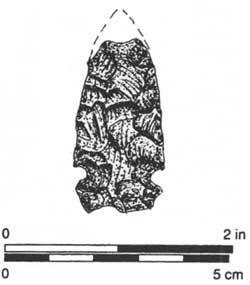 During the Middle Archaic period, a unique type of spear point also appears. Spear points that date to the Middle Archaic do not have side notches, as in earlier times, but have a stemmed base or are lanceolate-shaped [Figure 9]. 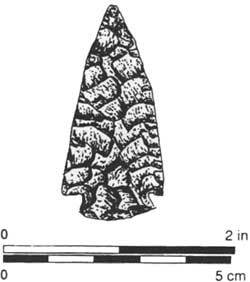 This new spear point is referred to as McKean, and might represent the influx of a new population into the northwest plains and Jackson Hole. X-ray florescence testing on artifacts from Jackson Lake supports this theory. This travel pattern, however, is not supported by artifacts found in archeological sites in the Wind River, Gros Ventre and Teton Wilderness areas of the Bridger-Teton National Forest adjacent to Grand Teton National Park. Obsidian artifacts found in these areas reveal that throughout prehistory no major travel corridor existed between the Yellowstone Plateau and Jackson Hole. In these areas, the primary obsidian sources are continually Teton Pass, Wright Creek, and Bear Gulch on the Targhee National Forest. As to whether the new spear point style was brought to the region by an entirely different culture is still debated. X-ray fluorescence testing of obsidian tools dating to the Late Archaic demonstrates a shift back to Teton Pass outcrops as the primary raw material source for Jackson Hole inhabitants. In general, the Late Archaic inhabitants of Jackson Hole used a wider variety of obsidian sources than did any of their predecessors. The travel patterns of this later group, however, closely mirror those of the earliest inhabitants 7,000 years earlier. They had a wide travel range and exploited a variety of obsidian sources ranging from Obsidian Cliff to southeastern Idaho. But, while human use of the valley intensified, the basic lifestyle remained unchanged. Plant gathering and processing, supplemented by hunting, were still the primary activities. Around 1,500 years ago, we see the beginning of a period known as the Late Prehistoric, which is signaled by the most dramatic change in subsistence patterns and technology to date. At this time, the bow and arrow replaced the atlatl as the primary hunting weapon. Consequently. 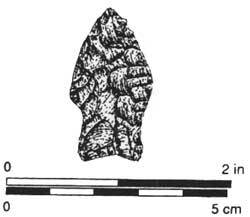 projectile points also changed, from large spear points to much smaller ar row points [Figure 11]. 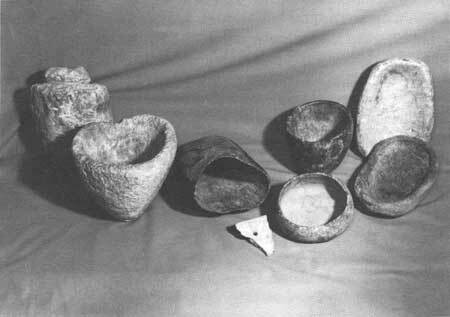 Another significant innovation in the Late Prehistoric period is the use of steatite or soapstone bowls and clay pottery [Figure 12]. Steatite is a soft stone that outcrops naturally in spots along the Teton and Wind River Ranges. This material is soft enough to be carved by an elk antler or other stone tool, and can be hardened by fire and exposure to air. In other areas, such vessels were used for cooking and storage, which was probably also the case in Jackson Hole. As before, Late Prehistoric inhabitants of Jackson Hole also engaged in hunting and plant processing. The number of roasting pits found in the park reached its peak during this period. The travel patterns of Late Prehistoric peoples changed slightly from that of their recent predecessors. An analysis of obsidian arrow points shows that the most popular sources for obsidian were Teton Pass, Obsidian Cliff, and Targhee National Forest. In general, fewer obsidian sources were used when compared to earlier times, and the use of obsidian sources in southeast Idaho was discontinued. This analysis, coupled with the discovery of the less portable steatite and clay vessels, suggests that the Late Prehistoric inhabitants of Jackson Hole had a much tighter range of travel than earlier groups. They did not range the 175 miles from Obsidian Cliff to Wright Creek as did some earlier populations. In general, the archeological record reveals little cultural change in the period between 10,000 to 500 years ago. The primary meat sources for mountain-dwelling humans were deer, elk, bighorn sheep, and some bisonwhile bison and antelope were staples for residents of the Great Plains. In both cases, humans relied on hunting and gathering. There is no evidence to suggest that prehistoric inhabitants of Jackson Hole practiced agriculture or established permanent settlements, as did populations in the southwest and eastern United States. It is important to remember, though, that from the Paleoindian through Late Prehistoric periods, the inhabitants of Jackson Hole and the entire New World were primarily pedestrian. It was not until the first Europeans arrived (around A.D. 1500) that the inhabitants of the New World acquired the horse. In the Rocky Mountains, horses were not widely used by tribes until around A.D. 1700. The arrival of the horseand the influx of European trade goods such as beads, metals, cloth, and gunsbrought about profound changes in the economic and cultural systems of the region.